Living in Chicago, I have eaten far more of the classic deep-dish pizza then I care to admit. It doesn’t help that there are more than a dozen pizza places within a 1 mile radius of me serving the piping hot, casserole-like, monstrosity by the slice at any hour of the day. 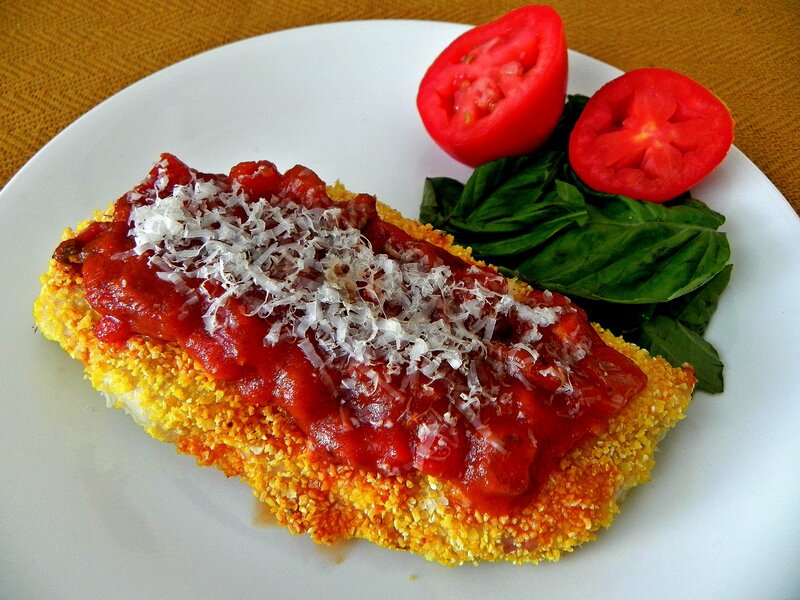 Since indulging in this Chicago classic made of a buttery, cornmeal crust, gobs of gooey cheese, and a perfectly stewed tomato sauce too often would send me to the doctor way more than I would ever like, I set out to create a healthy dish made with all the things I love about deep-dish pizza without sacrificing taste. This recipe is mostly protein and fat with some carbohydrates from the cornmeal and tomato sauce. Eat it with a small salad to add some additional carbohydrates and make it balanced. Beat egg + egg white and pour into a small casserole dish. Add cornmeal, basil, and oregano to a separate casserole dish and stir together until herbs are evenly incorporated. Pat chicken dry with a paper towel. One at a time, first dip chicken in egg then dip in cornmeal mixture. Place coating chicken on a baking sheet sprayed with cooking spray and bake for 15-20 minutes. Turn oven to broil and broil chicken for additional 3-5 minutes or until cornmeal is golden. Remove chicken from broiler, top each with 2 tbsp of tomato sauce (or 1/4 cup canned tomatoes) and 1 tbsp cheese. Place back under the broiler for 3 minutes or until cheese melts. *Serve with a green salad or roasted vegetables such as broccoli or zucchini.